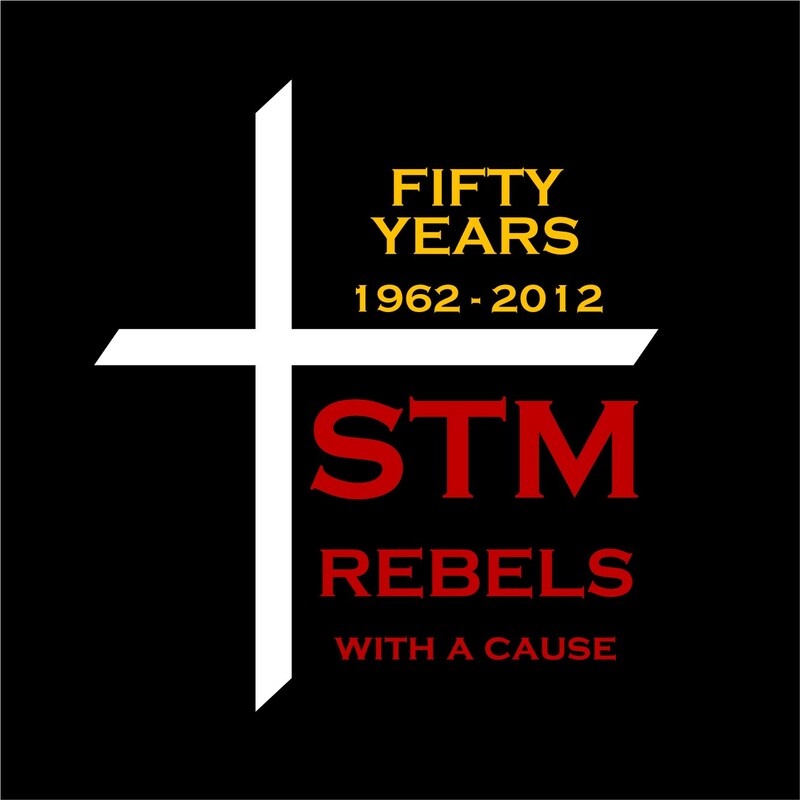 On August 30th, 1957, Bishop Bernard J. Topel established a new parish in north Spokane, St. Thomas More, and named Fr. Paul A. Wenning the first pastor. Since our new parish didn’t have a church, the first Masses were held at Lynnwood Elementary School and the rectory was the current home of parishioners Dennis and Andy Hansen at 7916 N. Excell Drive. Plans were in the works for a three-phase building project that would produce a new church/multi-purpose building, a rectory, and a four classroom grade school. Groundbreaking for the first phase was held in March 1958. In March, 1962, after the rectory was finished, school construction got underway and was ready for the first students that September. 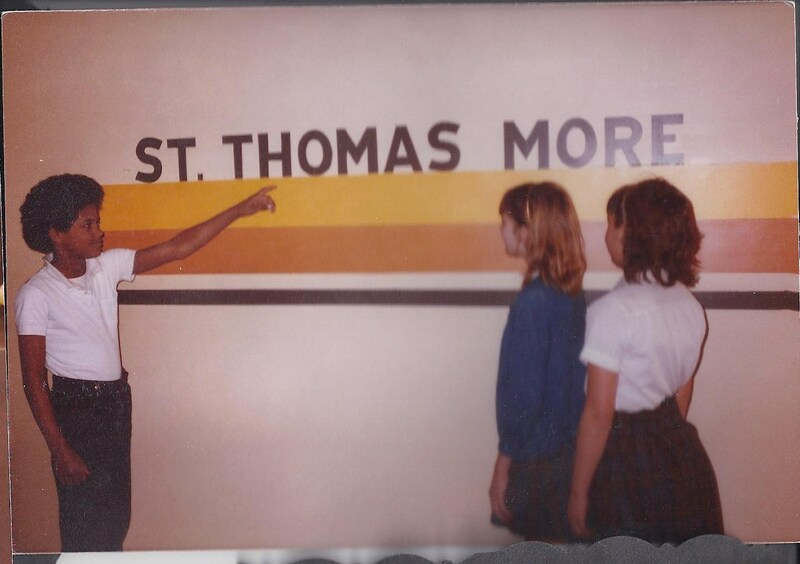 Initially, St. Thomas More School consisted of grades 5 through 8. The Dominican Sisters comprised the first faculty. Sr. Birgitta, the first principal, also taught a combined 7th/8th Grade class. 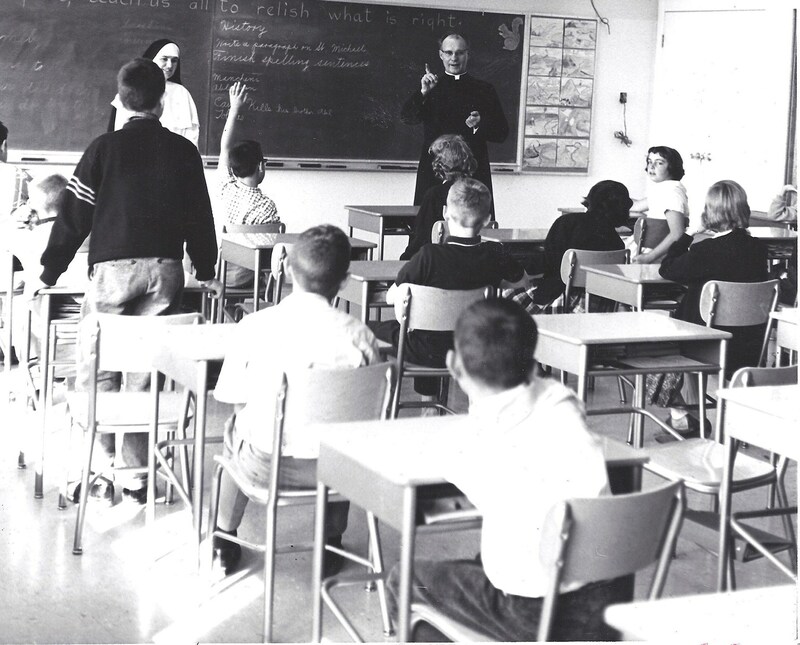 The 6th Grade was taught by Sr. Joan, and Sr. Fideles was the 5th Grade teacher. The following year, Mr. Ruddy was hired to take a full 7th Grade class and Sr. Birgitta remained the 8th Grade teacher. Construction for the remaining four classrooms and a library began in March 1967, and was completed in time for the new school year beginning in September. The north side of Spokane was growing fast, and in ten years, the Church evolved from borrowing places to celebrate Mass, to a full-fledged parish with new buildings to handle increasing numbers and growing needs. In 1987, the new church was completed. The original church building then became available for use to the school and parish community. Some remodeling was completed that enabled a gym, storage, a library, and a music room to be housed in the gymnasium building. In 1997, that library was then converted to a classroom for welcoming our first Kindergarten students. Enrollment at St. Thomas More School, which had declined in the early 1970’s, saw an upward growth trend as faculty and administration stabilized. The north side of Spokane grew significantly so that by 1990, eight classrooms were at maximum capacity with waiting lists for most grades. An Extended Care program was put into effect at St. Thomas More School in 1989 enabling families with single or two working parents to provide before and after school care for their children, and the fall of 2003 saw the beginning of a pre-school program that in 2008 was brought to completion with the addition of Infant Care up to Age 5. Every year, the school makes updates to the facilities. Some of the improvements made over the last 20+ years include: new windows, new roof on the school and gym buildings, new flooring in all buildings, new desks, 2 computer labs, new school library, improved playground area, front entrace enhanced, facade improvements, security, etc. The consistency in the school personnel has been overwhelming. Over the last 35 years there have been two principals, Ms. Ann M. Doherty from 1978 to 2000, and Deacon Douglas P. Banks from 2000 until present. In addition, Deacon Banks was the Vice Principal from 1986 until 2000. Over 80% of the faculty have Master Degrees. The school's enrollment has remained strong since 1986 with waiting list for many of the grades.